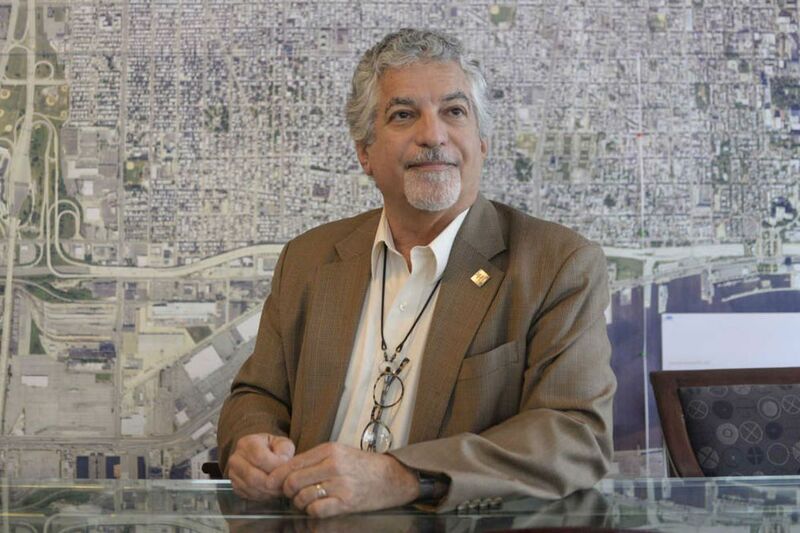 Alan Greenberger is chair of the Philadelphia Art Commission. The defacement last week of the Frank Rizzo statue in front of the Municipal Services Building has brought to a head a years-long controversy over whether the city should continue to honor the former police commissioner and mayor with a public monument. This week, Mayor Kenney announced that the status of the Rizzo monument would go under review. That job will fall to the Philadelphia Art Commission, a group of nine men and women drawn from the arts and business communities. Commission chairman Alan Greenberger said that the matter was unprecedented, as far as he knew, and that the commission plans to hold hearings on it, likely not before October. We pored over the group's charter and spoke to Greenberger to get a better sense of the group and its various duties. What is the Art Commission? A design review board composed of eight mayoral appointees and the commissioner of public property, the Art Commission meets on the first Wednesday of each month to review proposals for any building or public art project that is located on city property or funded with city money, including schools, statues, and building signs. Founded in 1911 as the Philadelphia Art Jury, it adopted its current name in 1952. "These kinds of commissions were set up in American cities about 100 years ago," said Greenberger, 65, an architect who served in Mayor Michael A. Nutter's administration from 2008 to 2016 in various positions, including deputy mayor for economic development. "It was in recognition of the fact that Philadelphia had one of the finest and most expensive collections of public arts in America," he said, "and there was a feeling that it would be good for the city to have a group who helped it improve its beauty and avoid ugliness." "We review proposals for a range of things, including public art, public buildings, public landscapes, and we have the authority to review, comment, and approve those things," said Greenberger, who heads the department of architecture, design and urbanism at Drexel University's Westphal College of Media Arts and Design. "I know it rankles some people, but the City Charter actually uses the words beautiful and ugly … and basically we are responsible for making aesthetic judgments on what is worthy as public art and public landscapes." The bulk of proposals put before the commission have to do with more mundane structures like "school buildings, new additions or new wings to schools, and buildings like the Juvenile Justice Center in West Philly." The commission must be made up of members of specific professions, including the commissioner of public property. According to the charter, the eight other members must include "a painter, a sculptor, an architect, a landscape architect, a member of the Commission on Parks and Recreation, and an experienced business executive," and finally two "members of a faculty or governing body of a school of art or architecture." José M. Almiñana. A Venezuelan-born landscape architect with the Manayunk-based firm Andropogon. Bridget Collins-Greenwald. A Philadelphia native who is commissioner of the Department of Public Property. Joe Laragione A Philadelphia-based painter. Natalie Nixon. Director of the strategic design M.B.A. program at Philadelphia University. Robert Roesch A sculptor and professor at the Pennsylvania Academy of the Fine Arts. His public art projects include the Gateway to Wichita, Kan.
Carmen Febo San Miguel. A Puerto Rican-born physician and executive director of Taller Puertorriqueño. Raed "Ray" Nasser. Chairman of the Parks and Recreation Commission and a data platform engineer at Broadview Networks. Mario Zacharjasz. An architect with PZS Architects LLC. The commission approves the installation of public art. Has it ever been involved with changing or removing it? "It's incredibly rare," said Greenberger, who cited two previous instances where a sculpture was relocated due to practical concerns. "The big Lincoln statue on Kelly Drive near the boathouses used to be on a traffic island, so that was moved over to get it out of traffic," he said. "And a piece called Phoenix that used to be at Dilworth Plaza … was moved to the foot of Society Hill Towers when Dilworth Plaza was renovated and turned into Dilworth Park." Has there ever been a case when a piece was moved or removed entirely due to changing public opinion or political controversy? The Rizzo case may well be unprecedented. "I couldn't say that for sure, but I have never heard of such a case," said Greenberger. What options does the commission have when it comes to the Rizzo statue? Has it been asked to rule on whether the statue should be moved to another location or removed entirely? "We haven't been presented with a proposal yet, so we don't know what the options are," said Greenberger. "The mayor's office is working on a proposal and once that is submitted, we'll have a sense of the options before us."